Woodrow Wilson: Father of Fantasy Baseball? John Thorn, basesball historian, has an amazing tale about Woodrow Wilson, the 28th US president, who as a boy appears to have spent 1871 creating a fictional version of the National Association season that year. 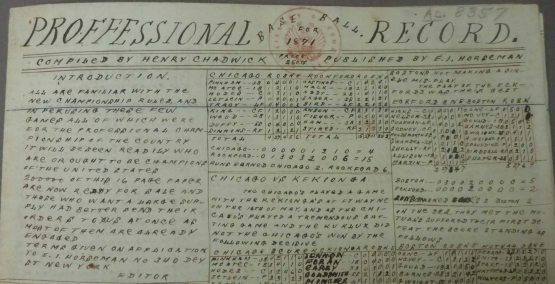 Found in the Woodrow Wilson collection at the Library of Congress was a handwritten end of season account, including box scores, that mimicked similar actual accounts published by Henry Chadwick. The attention to detail is amazing, and maybe a little scary. Read Thorn’s story for all the details, including an account of the “newspaper’s” sale by the auction house that is today called Southby’s, which attributed the piece to Chadwick himself. UPDATE: The linked story was originally published on February 24, 2014, but I just came upon it today. If you liked this story, you may like this one about the baseball game Jack Kerouac invented as a boy. The Fantasy Baseball Guide 2016 in Brooklyn!